Oh this one has me a little bit rage-y, so you’ll forgive me if I’m a little intemperate with my words, and a bit profane. 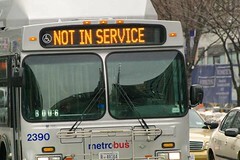 How the hell do you think that when caught texting while driving a metrobus, even after the “no tolerance” policy has gone into effect, that you could possibly try to get your job back? The driver has filed a grievance with his union and Metro and is insinuating that he should not have been fired for breaking DC law. I mean, I know that unions exist to protect workers from dangerous working conditions, but in this particular case, they seem to be here to protect the incompetent and the criminally stupid. Ah, the ATU 689, standing up for asshats that text while driving a bus full of people up the busy streets of the city. Where does the Riders Union file their grievance? Another public transportation worker who was texting while in control of the vehicle directly caused his own death and that of twenty four other people. This happened in Los Angeles, 2008, on the Metrolink commuter train. (See link below.) The DC bus driver should remain fired. The union should not defend this indefensible and outright dangerous behavior. To be fair, just because s/he’s filing a grievance doesn’t mean the union will support or advocate the grievance. It’s his right to do so, but the union doesn’t necessarily have to stand up for him on this one.